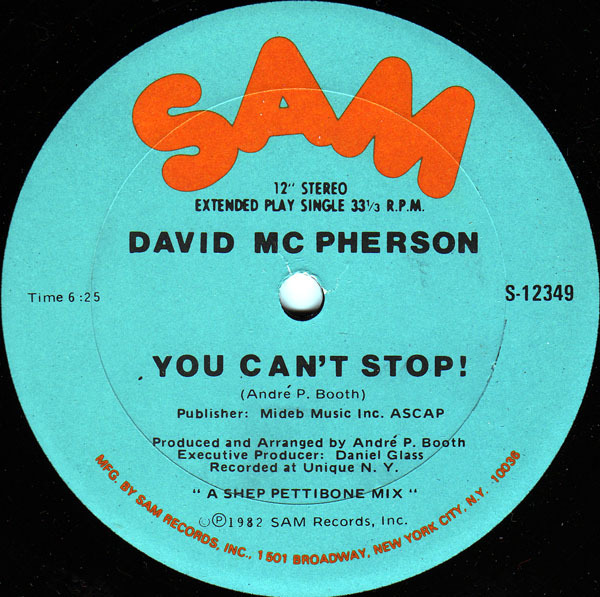 Released in 1982 on Sam Records, “You Can’t Stop” was the only track recorded by David McPherson. Sam Records was started by Sam Weiss in Long Island City, New York and was one of the many small labels that popped up during the disco explosion of 1976, the label would attract such talent as Darryl Payne, Shep Pettibone, John “Jellybean” Benitez, Mike and Brenda Sutton and many more. “You Can’t Stop” was written, produced and arranged by Andre Booth who wrote a number of singles for Sam Records in 1981-1982 and played keyboards on late 80’s hits by Rick James and Wally Jump Jr & The Criminal Element. The track would only appear on CD once and this would be in an edited version only, making this one of the rarer Shep Pettibone mixes and a must have for all Shep fans.